The Verona Historical Society Welcomes You! Dedicated to the collection, preservation, and promotion of Verona Pennsylvania's rich and interesting history. 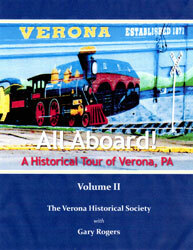 The Verona Historical Society (VHS) welcomes anyone who shares a love of history dealing with Verona's past. If you are interested in becoming a member or sponsor, please attend one of the scheduled meetings and obtain an application, or, go to our membership page; print out, complete form and mail to the VHS. The Verona Historical Society is proud to announce a new book by Gary Rogers highlighting Verona’s interesting past history. The cost of the book is only $15. Please add $5.00 for shipping. The book would make a wonderful gift to give or receive from a loved one for the Holidays. In either case, it will serve as a great addition to the interesting history of Verona and will certainly become a collector’s item. Proceeds will benefit the Historical Society’s efforts in continuing to preserve Verona’s history.